Third Party Developers like to use the "Nintendo gamers only buy Nintendo games" argument as an excuse for why they won’t develop for or bring their games to Nintendo consoles. Even though tons of Nintendo gamers crave this content 9 times out of 10 these games skip these consoles. I could understand the reasons Arkham City, or Assassins Creed 3, or a game like GTA4 couldn't work on Wii; but with WiiU in my opinion there is no excuse. I guess that’s part of the reason I wanted this game so badly; its not only because it looked good, and the story seemed interesting, but because Good quality third party titles on WiiU are so far an few between that when I see a developer take the time out to support the console I feel obligated to buy their game. It’s as if to say, thank you for the support and we greatly appreciate it. 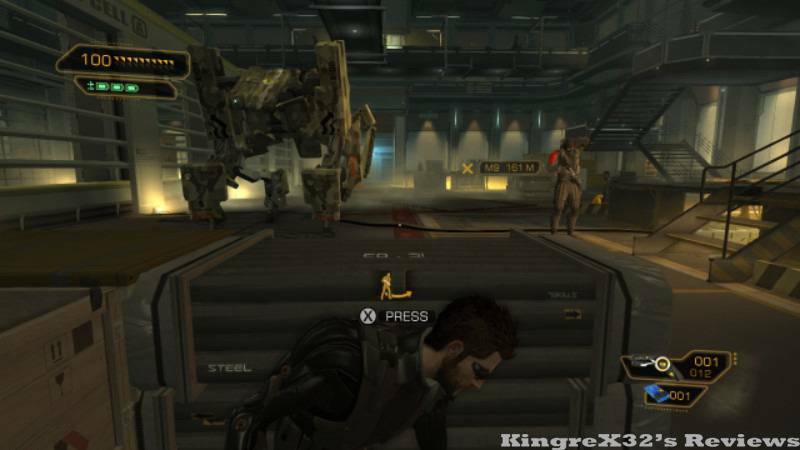 Deus Ex Human Revolution Directors cut was co developed by Eidos Montreal and Straight Right Games. It was published by Square Enix and Released on October 22nd 2013. The year is 2027 and Human Augmentation is becoming the norm. You play as Adam Jensen a former cop who is now head of security at Sarif Industries, a biotech company that specializes in designing high tech prosthetics for Human augmentation. After a terrorist attack leaves Jenson horribly injured he undergoes an extensive augmentation to replace his arms and various internal organs. Now he has to figure out who was behind the attacks while being drawn into the politics of human advancement and augmentation. Like real life politics knowing what to say or how to say it is very important; Deus ex is the same. 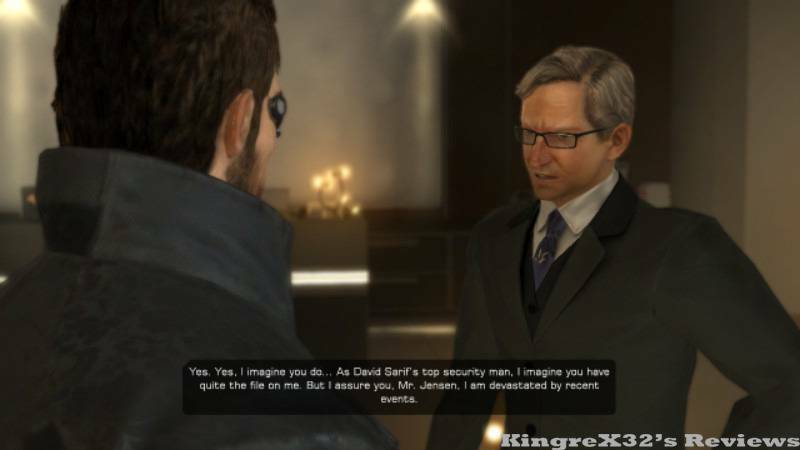 Featuring a system similar to Mass Effects “Dialogue” feature players in Deus Ex in certain situations can choose what Adam says to NPC’s during scripted events. Adam can choose between different persuasion methods in order to get a certain outcome. Choose wisely as these conversations have lasting effects on the game. You may lose a character or miss out on an opportunity so pay attention. In order to better your social skills you have to Upgrade Jensen’s social enhancer augmentation. To do that you need Praxis Points. 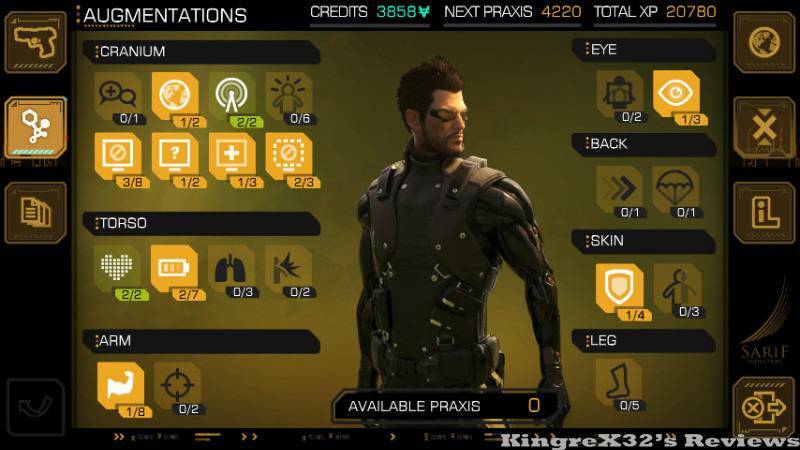 Praxis, Praxis Points or Praxis Kits are used to upgrade or activate Jensen’s Augmentations. A lot of areas are available from the start of the game but most are inaccessible because of augmentations that are not high enough in level. A perfect example of this is an alleyway in the game that acts as a shortcut between the two sections of Detroit. One of the branching paths that take you near by your apartment is blocked with dumpster; unless your arm augmentations are at level 4 or higher (move heavy objects) then you can’t get past. This works the same way for your hacking skills (more on this later) unless you have a remote unlocking device you cannot hack any computers or security terminals with a security rating higher than your hacking level. Praxis points can be earned a number of ways; the easiest is by completing, objectives or levels. Once you gain enough XP you are given a point. The Second way is by visiting L.I.M.B. Clinics and purchasing Praxis Kits. As you play through the game there are various computers and security terminals to hack. Hacking security terminals will disable alarms but guards can still reactivate them. 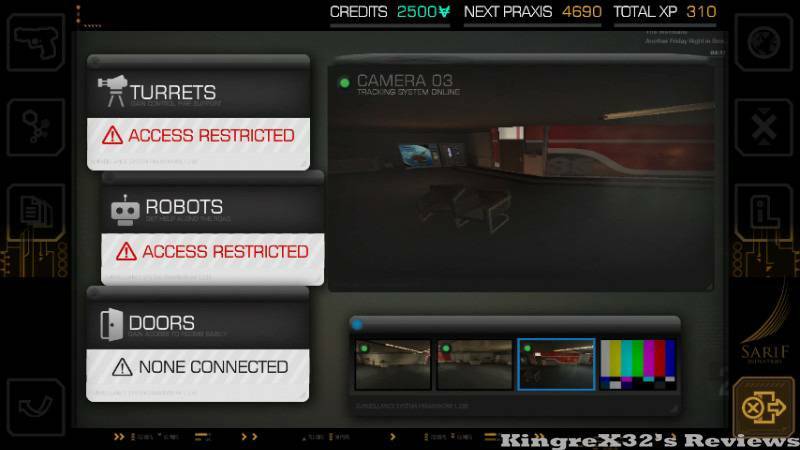 Hacking computers is way more important than security terminals as sometimes mission objectives or extra information pertaining to the mission are stored on computer folders. Every now an then you will come across a computer directly connected to the security system which allows you to turn off cameras, unlock doors, disable turrets, and turn off laser grids. While hacking you are on a timeline and if you run out of time before a hack is completed you will be kicked out of the system for 30 seconds, this will also raise alarms and alert guards to your presence. 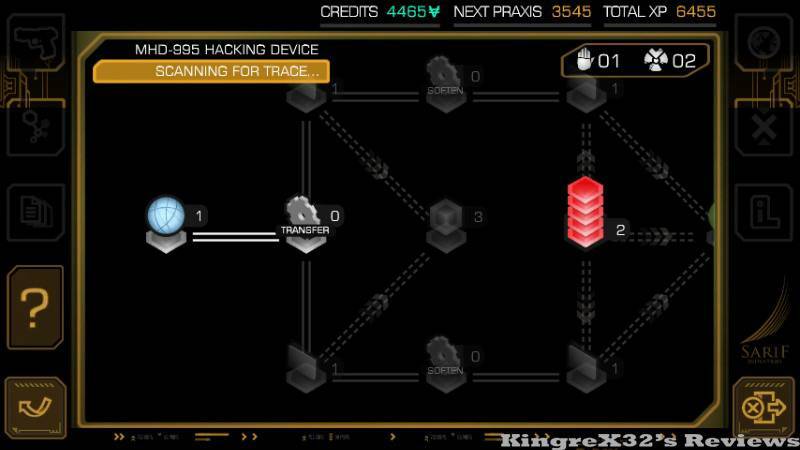 As you upgrade your hacking skills hacking become easier like giving you more time or delaying the trace allowing you to capture more nodes before being detected. You can also use Nukes and Stop Virus programs to assist you during a hack. These programs are consumables so use them only when you really need them. If your hacking skills/augmentations are not at the proper levels (Upgraded with Praxis Points) you can’t use most of these features until they are. Same goes for hacking, if your skills are below the security level you cannot hack the device. 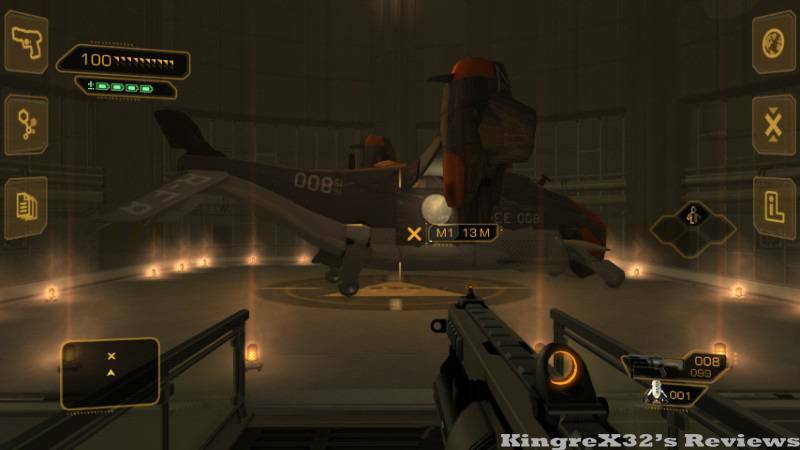 Deus Ex is like a mix of ZombiU and Splinter Cell Blacklist; ZombiU due to the games very heavy use of the gamepad as everything like inventory, mini maps, objectives, Praxis Upgrade systems, voice notes, weapons customization, hacking mini games, security footage, e-mail’s, e-books, and pocket secretary files, are all accessed from the Gamepad, and Splinter Cell because of the combat. 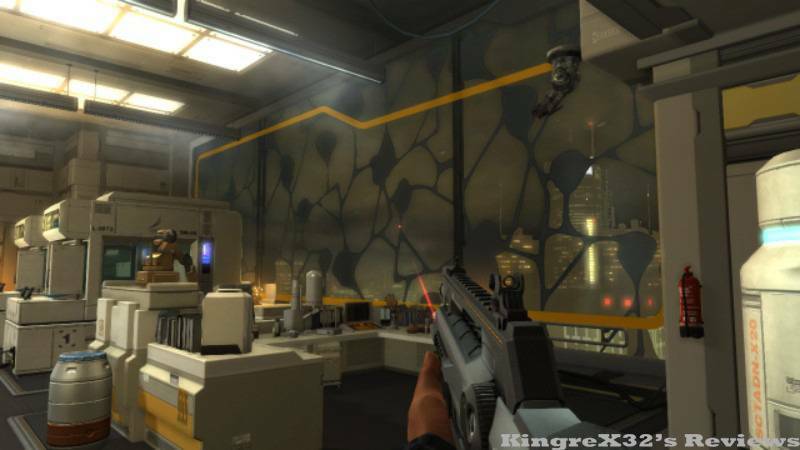 Deus Ex is a primarily stealth game but if you want you can try to Rambo your way through although this is not recommended. Avoiding enemies and Making as less noise as possible are the best ways to avoid a fight that means using knockouts, stun guns and silenced weapons are important. You can use the games weapon customization system to put silencers on your weapons. If you have to fight your way out you have to use cover, even with Jenson’s Dermal Armor Fully upgraded he cannot last long in a straight up fight; setting traps, using cover and simply just running away are recommended. The Health Bar regenerates very slowly so caution is advised especially when in the middle of a fire fight. Your Augment energy also regenerates slowly if you run out you will not be able to use your takedowns, or anything that requires augmentations. Luckily even if your health and Augment energy is down a quick search of the environment can help you find items to replenish them. Like Resident Evil 4 your inventory fills up quick so making the best use of space and upgrading your Augmentations for more space are a big help. 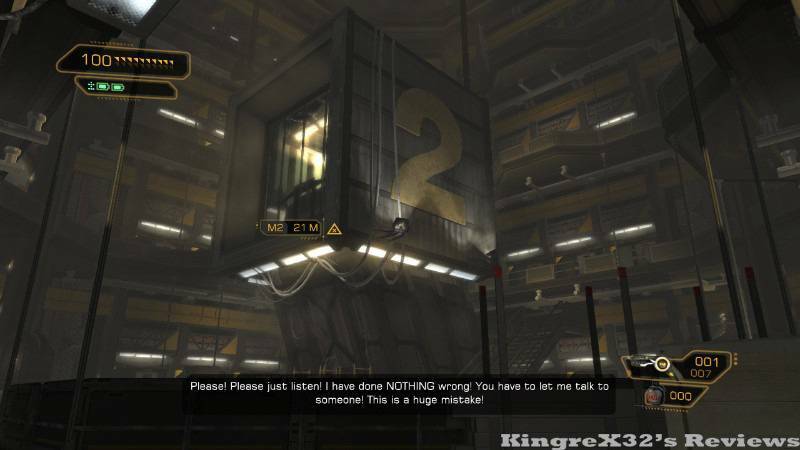 Deus Ex is a very Story Driven First/Third person Action/Stealth game; as such at the end of certain levels there are boss fights. It’s during these times that effectively using cover and stealth are needed; bosses have more health and taking them on toe to toe IS NOT AN OPTION!!!! The Great thing is these boss fights are pretty straight forward and don’t require you to discover patterns or exploit weak spots, all you have to do is use your head. Like most games defeating bosses wields great rewards like credits or weapons. While this game does not have any DLC on the Eshop, it is like every WiiU game integrated with Miiverse allowing gamers to post in game achievements directly to the games Miiverse Community. There is also a cool feature in the game that allows gamers to leave in game voice notes for themselves to reflect on current or past levels. 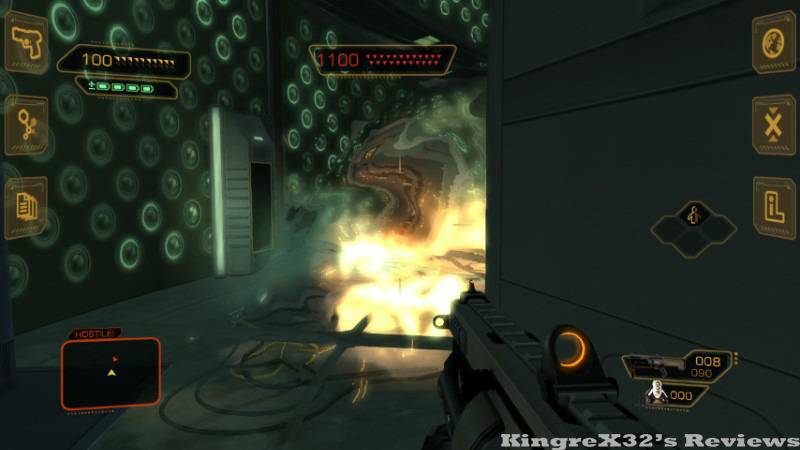 Deus Ex is a great looking game, even on a standard definition TV the visuals are sharp and though the game itself is little dark everything is easy to see and everything looks and runs smoothly. 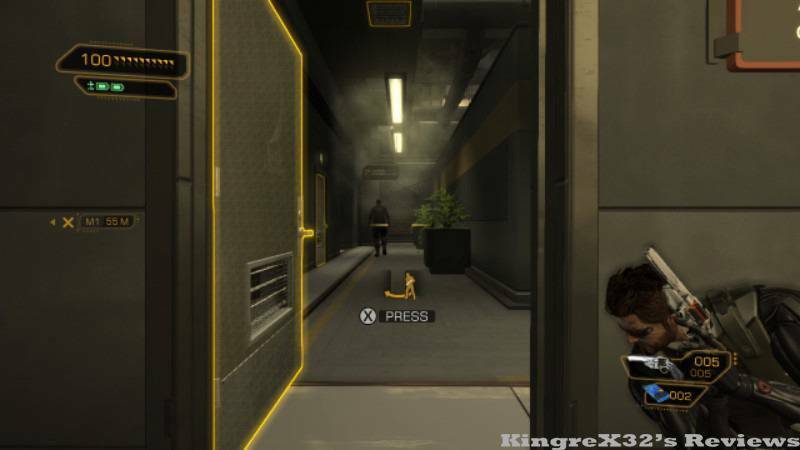 The gameplay in Deus Ex is also great, between the Hacking, Combat, numerous side missions, weapons upgrades and stealth mechanics the game always feels fresh. Much as I do like the gameplay though the nature of stealth games is that one mess-up can get you killed and sent back to the last checkpoint, and a few of the levels took a while to get through because of this. Control wise this game is not like typical Shooters, Aiming down Sight, Sprint, Cover, in Deus Ex all of these are done with completely different buttons that will take gamers a while to get used to. So read the instructions. Some of the problems I encountered in the game were small and far and few between. My main issue with the game was long load times, the average wait being 20 to 40 seconds. This is most noticeable during a particularly difficult level involving Mission impossible Style laser grids. My Second gripe was with Hacking. The tutorial helped but didn’t really help. I found that I learned how to hack through lots of trial and error. Despite these issues the games good far outweighs the bad, I loved the deep and varied gameplay elements, I enjoyed the voice note feature, I liked that a lot of the environments were interactive, I enjoyed the story and how it reminded me of a novel. The games length is great also depending on how you play you can get a minimum of at least 15 hours out of it. The side quests were few but long enough and interesting fleshing out more of the games back story. All in all this is a great title well worth the money and I recommend any or all WiiU owners to go out and purchase it. 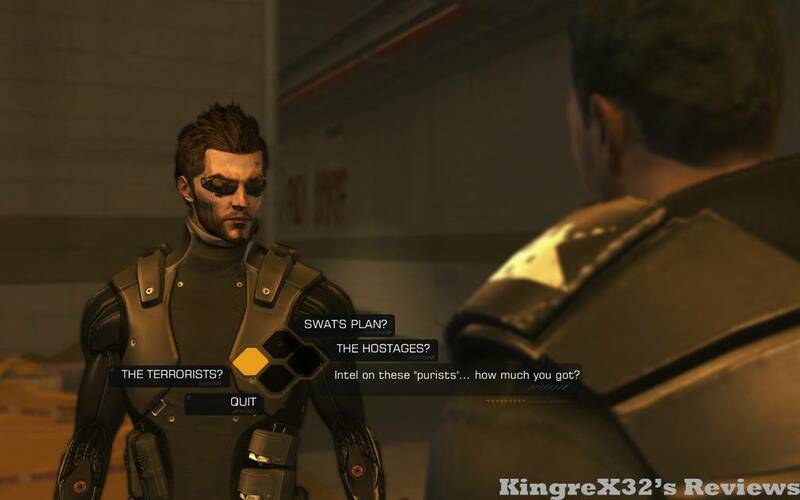 Deus EX human Revolution Directors Cut gets 10 out of 10. I'm not big into mature games, but this sounds like a great game so I might download this at some point. Thanks for reviewing this game @KingreX32! I don't know as I haven't purchased the game yet. I really have to get this game! Excellent review! I completely agree Dues Ex is an amazing game!